It is very sad when an adult pressures his/her child into saying “Hi” or “Thanks”. I always feel terrible when I am the one who is supposed to hear a child say it to me, and I always say it first myself and quickly move on to the next subject, especially when I see that this poor kid is shy and scared of his parent’s pressure. I don’t force my kids to say those things, I say it for them, and if they feel like joining in, then great. If they are shy or not comfortable with strangers, then who cares really? We say it a lot at home, more than we normally would in our old childless life, but it works. Both my kids always say “thank you” and “welcome” to each other. It is too cute to watch them pass toys, books, or snacks, and keep thanking each other. I am sure they don’t always understand why they are saying it (especially my 21 m/o) but the idea is there, and they find it fun to imitate what Mom and Dad say all the time. Isn’t it better when it is not forced but sincere, and no intimidation or hard feelings involved? 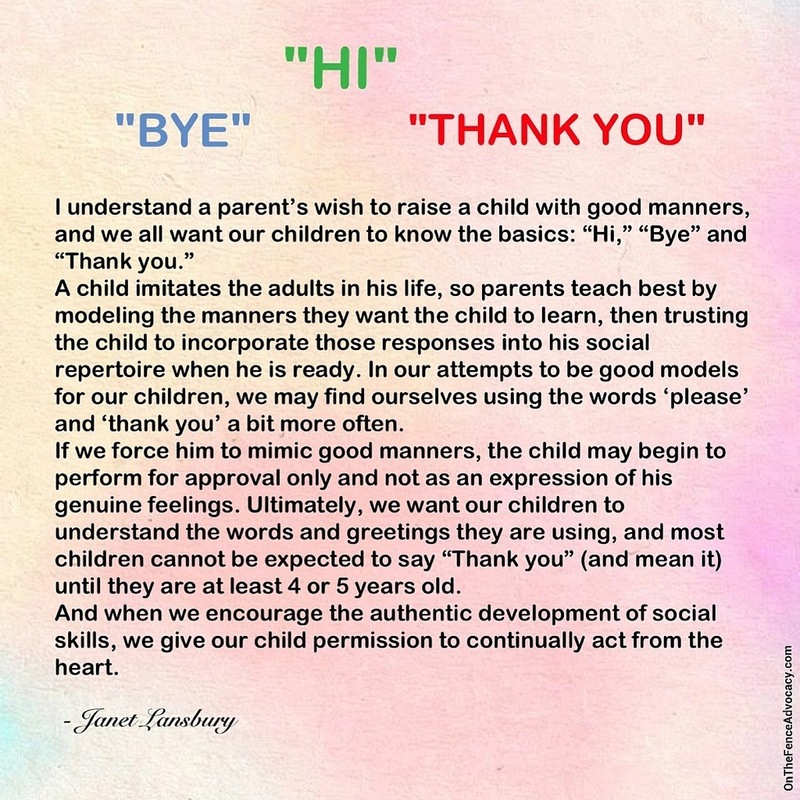 “I understand a parent’s wish to raise a child with good manners, and we all want our children to know the basics: “Hi,” “Bye” and “Thank you.” Our children’s public behaviors feel like a giant reflection on us, both as people and as parents. When someone greets our baby, we worry that the person might feel rebuffed if the baby does not respond in kind. Even though this fear is usually unfounded, most of us believe our child’s social emotional development is more important than the possible ruffled feathers of others. How do we best teach children to be polite and caring, while also encouraging their authentic responses? The answer is to trust and model.